Ginny Swart is a freelance writer based in Cape Town, South Africa. Ginny started writing in 2000 and has had four books published and over 800 pieces accepted by anthologies, e-zines, school textbooks and women’s magazines all over the world. She was the overall winner of the 2003 Real Writers International short story competition and short-listed for the international section again in 2004. Ginny is also the short story tutor for the on-line South African Writers College, the New Zealand Writers College and the UK Writers College. Harry’s eyes burned, and underneath his fur-trimmed Father Christmas cap, his head ached. For the hundredth time that day he’d faced a flash camera with a small child on his lap in various stages of terror or bad temper. Thank heavens it was only a temporary job. His friendly manner and his snow-white beard—a souvenir of forty years in the navy—made him a natural Father Christmas, and he loved children too. At least he used to. But over the past three weeks, he’d changed his mind. Many kids screamed when their parents forced them to sit on his lap, and his shins were blue from the kicks of unwilling toddlers. What a relief. At six o’clock on Christmas Eve, his job was over. He removed the red suit and collected his pay. If he never heard another carol or saw another child, it’d be too soon. As he walked to his car, he pondered the Christmas break that stretched bleakly ahead. What would he do with himself for the next few days? Opening the door, Harry realised with a start that he still wore the red cap. He stuffed it into his pocket, and then drove off with nothing more to look forward to than an empty home and a frozen TV dinner. Just before turning into his street, a crowd of people blocked his way. They stood around a crumpled car and watched a still figure lying on the ground. Harry parked and hurried over to see if he could help. As a seaman, Harry had known first aid, and he bent over the man to feel his pulse. Still alive. The man’s dark eyes flickered open and fastened on Harry. “Got to get there . . .” he said. “Take what?” said Harry. “Lie still now, maybe I can help.” He worried that the man’s agitation would make his condition worse. With a tremendous effort, the man whispered, “To the children. Tonight.” And then his eyes rolled back in his head. His children? Where did they live? An ambulance howled to a stop, and the paramedics got busy. They strapped the man onto a stretcher and slid him into the back of the ambulance. The ambulance doors slammed, and the siren wailed as they sped off. The crowd slowly drifted away and left Harry standing alone. He walked to the wrecked car and saw keys dangling from the ignition. On impulse, he leaned in to take them. The damaged boot didn’t open easily, but he forced it halfway and reached for the bag inside. Feeling like a thief, he rushed to his car and started the engine. As he pulled out, a police van squealed to a halt, followed closely by a tow truck. The bag was filled with brightly wrapped gifts. Harry remembered reading something about Sunshine Home, a children’s place no more than three blocks from where he sat. Harry knocked on the door of the big, dilapidated house. As if on cue, a smiling, grey-haired woman opened the door immediately. He told her about the accident, and she was horrified. Then Harry guiltily recalled that the store manager had complimented him on his warm way with the children. Yes, but that was before he’d sworn off kids. Oh heck, he thought, unable to resist the appeal in her deep blue eyes. Well, I’ll just hand over the gifts and be off. Twenty minutes at the most. Liar, he thought, you’ve had three weeks of practice. She hurried off and soon returned with a bright red gown which more than covered Harry’s ample girth. She stood back and admired the full effect. She put her finger to her lips and motioned Harry behind the door. She grinned at Harry and walked out of the room. Better do this properly. He picked up the sack, let himself out of the front door, and stood on the veranda. Soon the sound of childish voices singing Jingle Bells filtered out to him, and he waited until they were finished, enjoying the melody, sung rather off-key. Then he gave three loud knocks. Recognising his cue, he opened the door and stepped inside. “Father Christmas!” Shrieks of glee greeted him, followed by laughter and clapping. Fifteen washed and shining faces beamed at him. “Here’s your place, Father Christmas,” said a chirpy voice, and a small brown hand clutched his and led him to a decorated armchair in the centre of the room. Harry sat and smiled. Suddenly, a cluster of children didn’t seem so bad, not when they were this pleased to see him. He rummaged in the bag and pulled out a gift. A little boy crept towards him, and Harry noticed scars on Derek’s legs. Harry patted his knee encouragingly. “Five,” whispered Derek, staring at the floor. Five? He looked about three, small and skinny with bitten fingernails and a narrow, anxious face. No child should look like this, fumed Harry. He thought of his own confident, well-fed grandchildren who lived far away. “I won’t.” Derek slid off his lap, clutching his gift importantly, his face split in a wide grin. One by one they clambered onto his lap, and once their first shyness had worn off, they chatted to him like old friends. He gave them all a gift, a hug, and a tickle that sent them off in explosive giggles. The children greeted each small gift with astounding joy. They cheered at the sight of little cars and cheap plastic dolls. They even carefully folded the wrapping paper to keep for future use. All too soon, his sack was empty. “What now?” he mouthed to Mary. She stood and announced that Father Christmas had to be off to visit other children all over town. “Let’s sing him our favourite carol while he goes,” she said. The children stood noisily, gathered together, and began to sing Silent Night. Harry had such a lump in his throat he left hurriedly, hardly able to smile and wave. He made it to the veranda before blowing his nose hard. He stared into the garden, grateful that nobody could see him wipe his eyes. Driving off, Harry thought about which tools he’d need to bring. And he’d like to buy flowers for Mary and sweets for the children. Christmas Dinner with Mary Banks and fifteen children. Harry whistled happily at the thought of it, and only later realised the tune was Silent Night. 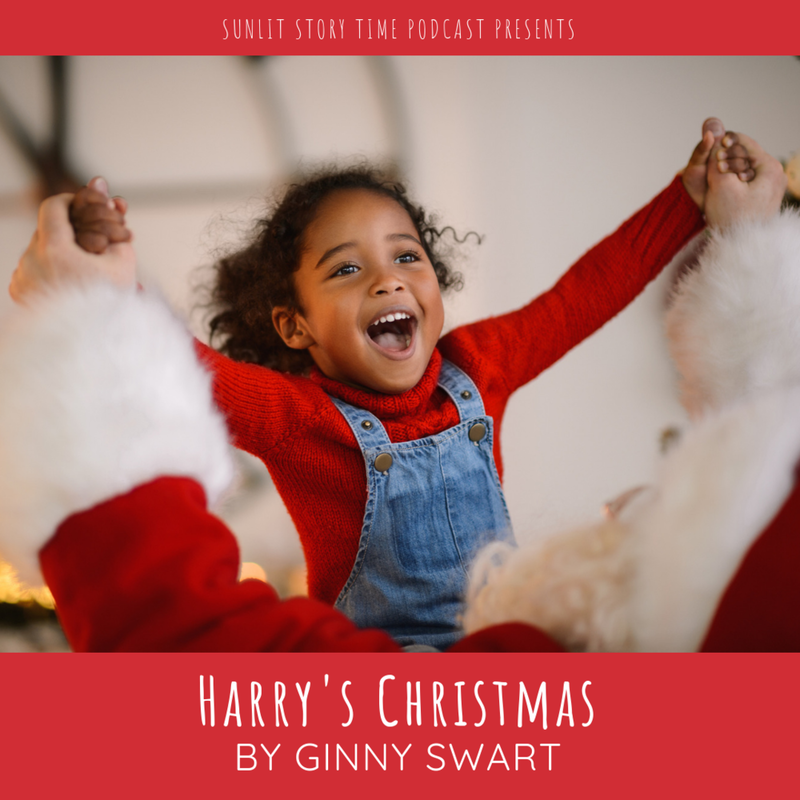 Harry’s Christmas was written by Ginny Swart. Harry, a retired naval man, has been working as Father Christmas at the mall, but has become very disillusioned with the spoilt and demanding brats he has to deal with. He is happy when his job comes to an end on Christmas Eve and tells himself that if he never sees another child it will be too soon. But then something happens to change his mind. At SunLit Story Time, we believe in the Power of Story. If you believe too, then share Harry’s Christmas with everyone you know. Together, we’ll make the world a better place one story at a time.